U.S. President-elect Donald Trump speaks at his election night rally in Manhattan, New York To read more: http://cbc.ca/1.3842225. 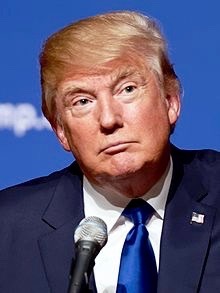 Donald John Trump (/ˈdɒnəld dʒɒn trʌmp/; born June 14, 1946) is an American businessman, reality television personality, real-estate mogul, and the President-elect of the United States. In June 2015, Trump announced his candidacy for president as a Republican and quickly emerged as the frontrunner for his party’s nomination. In May 2016, his remaining rivals suspended their campaigns, and in July he was formally nominated for president at the 2016 Republican National Convention. He won the general election on November 8, 2016 by earning more Electoral College votes than Democratic nominee Hillary Clinton. His transition planning for his administration is currently underway, and he is scheduled to be inaugurated on January 20, 2017. At 70 years old, he will be the oldest person to assume the presidency. Trump was born and raised in New York City and received a bachelor’s degree in economics from the Wharton School of the University of Pennsylvania in 1968. In 1971 he took control of the family real estate and construction firm, Elizabeth Trump & Son, and renamed it The Trump Organization. He expanded it to include numerous other products and activities. Trump has built office towers, hotels, casinos, golf courses, and other Trump-branded facilities worldwide. 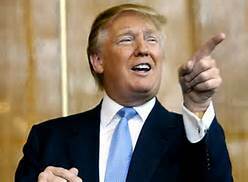 Trump owned the Miss USA pageants from 1996 to 2015, and has made cameo appearances in films and television series. He hosted and co-produced The Apprentice, a reality television series on NBC, from 2004 to 2015. He sought the Reform Party presidential nomination in 2000, but withdrew before voting began. As of 2016, he was listed by Forbes as the 336th wealthiest person in the world, and 156th in the United States, with a net worth of $4.5 billion. Trump’s 2016 presidential campaign received unprecedented media coverage and international attention. Some of his statements in interviews, on Twitter, and at campaign rallies have been controversial or false. Several rallies during the primaries were accompanied by protests. Trump’s platform includes renegotiation of U.S.–China trade deals, opposition to particular trade agreements such as NAFTA and the Trans-Pacific Partnership, pursuit of energy independence using all energy sources with opposition to policies and agreements aimed at combating climate change such as the Clean Power Plan and the Paris Agreement, stronger enforcement of immigration laws together with building a wall along the Mexico–U.S. border, reform of veterans’ care, repeal and replacement of the Affordable Care Act, abolition of Common Core education standards, investments in the country’s infrastructure and a simplified tax code with lower rates. Following the November 2015 Paris attacks, Trump called for a temporary ban on Muslim immigration, which he later changed to a policy of “extreme vetting” from certain areas of the world. Trump was born on June 14, 1946, in Jamaica, Queens, a neighborhood in New York City. He was the second youngest of five children. Of his four siblings, three are living: Maryanne, Elizabeth, and Robert. Trump’s older brother Fred Jr. died in 1981 from alcoholism, which Trump says led him to never drink alcohol or smoke cigarettes. Trump is of German ancestry on his father’s side and Scottish ancestry on his mother’s side; all four of his grandparents were born in Europe. His father, Fred Trump (1905–1999), was born in Queens to parents from Kallstadt, Germany, and became one of the biggest real estate developers in New York City. His mother, Mary Trump (née MacLeod, 1912–2000), was born in Tong, Lewis, Scotland. Fred and Mary met in New York and married in 1936, establishing their household in Queens. His uncle John G. Trump, a professor at Massachusetts Institute of Technology from 1936 to 1973, was involved in radar research for the Allies in the Second World War, and helped design X-ray machines that provided additional years of life to cancer patients; in 1943, the Federal Bureau of Investigation requested John Trump to examine Nikola Tesla’s papers and equipment when Tesla died in his room at the New Yorker Hotel. Donald Trump’s grandfather was Frederick Trump who amassed a fortune operating boom-town restaurants and boarding houses in the region of Seattle and Klondike, Canada. 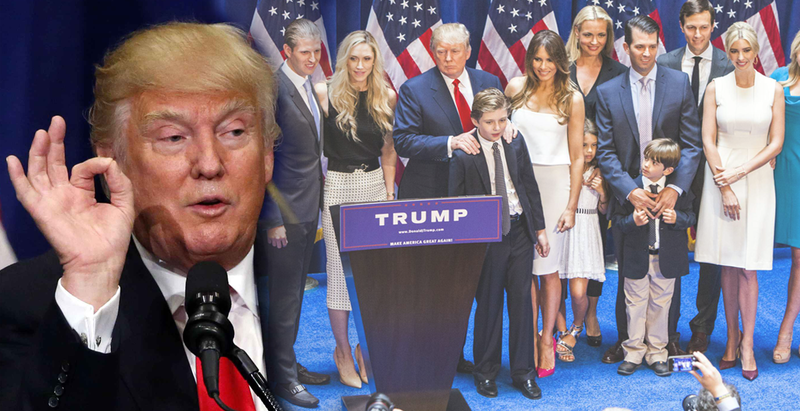 The Trump family were originally Lutherans, but Trump’s parents belonged to the Reformed Church in America. The family name was formerly spelled Drumpf or Drumpft, and later evolved to Trump during the Thirty Years’ War in the 17th century. Trump has said that he is proud of his German heritage; he served as grand marshal of the 1999 German-American Steuben Parade in New York City. A black-and-white photograph of Donald Trump as a teenager, smiling and wearing a dark uniform with various badges and a light-colored stripe crossing his right shoulder. 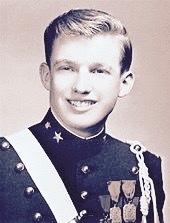 This image was taken while Trump was in the New York Military Academy in 1964. Trump attended Fordham University in the Bronx for two years, beginning in August 1964. He then transferred to the Wharton School at the University of Pennsylvania in Philadelphia, which offered one of the few real estate studies departments in United States academia at the time. While there, he worked at the family’s company, Elizabeth Trump & Son, named for his paternal grandmother. Trump graduated from Wharton in May 1968 with a Bachelor of Science degree in economics. Trump was not drafted during the Vietnam War. While in college from 1964 to 1968, he obtained four student deferments. In 1966, he was deemed fit for service based upon a military medical examination, and in 1968 was briefly classified as fit by a local draft board, but was given a 1-Y medical deferment in October 1968. In an interview for a 2015 biography, Trump attributed his medical deferment to heel spurs. In December 1969, Trump received a high number in the draft lottery, which would also have exempted him from service. He was given control of the company in 1971 and, in one of his first acts, renamed it to The Trump Organization. He became the president of the organization in 1973. That year, he and his father drew wider attention when the Justice Department alleged that they were discriminating against blacks who wanted to rent apartments, rather than merely screening out people based on low income as the Trumps stated. An agreement was later signed in which the Trumps made no admission of wrongdoing, and under which qualified minority applicants would be presented by the Urban League.